There is nothing worse than waking up on a morning in early October to snow and realize that your daughter does not have a winter coat for the season. Not wanting to be known as an unfit mother, you wake all the kids up, scrape the van, load them up, toss them back a granola bar, and rush to Target to pay full price for a new winter coat before school starts. You have her rip off the tags on the way, and as you pull up to the school, see that the sun is out, the snow is almost all melted, and most kids are still in hoodies, because who shops ahead? You do! Because it will save you a lot of money. By shopping ahead, I simply mean trying to stay about a year in advance of your kids when shopping for clothes. Right now is the perfect time to be buying winter clothes for next year. Be looking for those coats, gloves, sweaters, boots, christmas morning pjs, christmas dresses and suits in the next sizes up now, so you don't have to pay full price next winter. 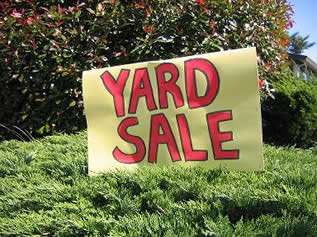 You can shop for them anywhere: yard sales, thrift stores, clearance racks, hand me downs from cousins. Next year, it will feel so good to walk past the beautiful, fluffy Christmas dresses at the store with their retail price, go home, pull out what you bought last year and remember how much you saved. A lot of you made a killing at the Old Navy clearance sale~now we just need to store it and keep it organized. But wait, don't you have 5 kids? Do you have stacks of these bins everywhere?? Basically yes, lol. My garage is stacked from floor to ceiling! But they aren't all kids' clothes! Luckily, I only have to buy ahead for my oldest girl and boy, since I have another girl right after the girl, and the other 2 boys right after the boy, so they just get handed down. They are still young enough that they don't mind the hand me downs, and they do get some new things each year. After the youngest outgrow them, we get rid of them. Every season, when we switch out clothes, we go through the bins and decide what we need to "complete" the wardrobe for the season. Usually it's not much, and in fact sometimes I realize I went a bit overboard. Most often, it's socks, underwear, tights, etc. This is also a great time to see what we need to be on the lookout for for the next season. I keep the things to be looking for on a little 3X5 index card in my wallet. I got that great little tip from my friend, Lynee. Then, when you are at a sale or a garage sale, etc. you can pull out your trusty card and say, oh yeah, I need some size 5T jeans and bottoms for Johny, and some dresses for Suzy in a size 9. Sometimes you can hit the jackpot at a yard sale or thrift store and buy a whole season worth of clothes in one hit. I love it when that happens! I love for my kids to look cute, but this is the only way I can do it for 5 of them on a grad student budget. How do you save money on kids clothes? I love your comments. I love to shop ahead for my girls. I was so sad when Target clearanced their winter dress boots and snow boots a week earlier than usual here in UT. I missed the sale by a week. I did score a Christmas dress for next year at Target for 3.41!! You can't beat that! Great blog! I love the idea to keep a list in my wallet. I, also, love those rubbermaid bins and have my husband kidding that we have more than anyone on the block! You can never have too many of them. Great ideas, and I use a lot of them, as I have six kids! Course, three of them are teenagers (translation: name-brand clothing), so I do the majority of my shopping at thrift stores. Same name-brand clothing, not the name-brand price. My oldest is 17, and I've been shopping at my fave thrift store since she was about 18 months old. I also do consignment stores for the older ones. At these prices, I rarely save clothes for the next ones down, as I have four boys and...well, you get the picture! I shop the same way for my four kids...about a year ahead. I love all your tips and especially the reminders about when the good sales are. Usually I just happen to stumble upon them, but you've made it that much easier for me by giving me the dates. I always forget to write that stuff down. I'm really sad because I missed the Old Navy sale last weekend. My hubby had to work all weekend long and my kids had strep throat...so I missed it. Boo-hoo. I did however get some good stuff at Target. All of their marked down clothes were an additional 30%off. Gotta love a bargain! Amen! I NEVER pay full price for clothes for the boys. It is insane that people actually pay $30-$40 for jeans for toddlers!!!! What a waist of mulla! 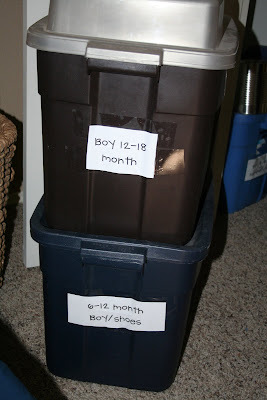 I a all about those storage bins, my husband HATES dragging them up into the attic. I have totes in the actic. Since we are foster parents we try to keep several days worth of clothing in many sizes in case we need them. We also have a tub of coats we have picked up for a song. It makes our budgets for the children go further if we pick up nice clothes on sale and at garage sales. This is all great stuff to read - I need all the tips I can get! The Old Navy sale was awesome and then I got a few things at the Children's Place - they were doing an additional 50% off (I think they still are), got an additional 15% off of that and free shipping so I think we are all set for next year. The only thing I need to start looking for is shoes - I don't think it's going to be long before Mckenna starts walking and I've seen how expensive little baby shoes are - they are crazy! I just recently found your blog and love it! We will probably be buying our first house in the next year or two and seeing your remodeling has given me hope and courage! Keep up the good work! I do the same thing. I get really good deals (like $3 shirts and shorts) at the Children's Place clearance, and there's almost always a coupon code available if you google it. Oops...I'm not Craig, that's the hubby. I do the same with the totes only my 3rd girl has decided to be the picky one! She has tons of clothes from her sisters that she won't wear and it drives me crazy! I end up buying her things on clearance so, I don't have to see her wear the same two outfits over and over but I have to let her pick them out. I usually hit the Childrens Place outlet as they put the clearnace 50% off all the time. They consistently get things in from the regular stores and I've been there when they unpack a box and scored huge! 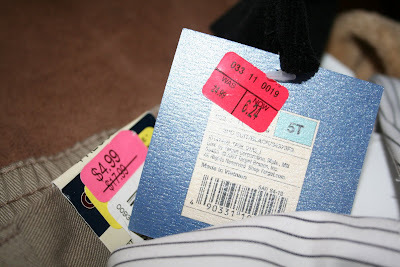 I also shop ahead with clearance,it still works for my 8 year old but once my now 15 year old hit 7th grade it came to a screeching halt and I had a rack of clothes that he did not care for. As they get older it is hard to predict what they think will be cool.